Quilting A Memory is a 501(c)3 charity dedicated to providing free quilting services to the families of lost or fallen US service men and women. Their clothes and uniform are collected, deconstructed and then pieced back together to create a beautiful and unique quilt filled with love and memories. 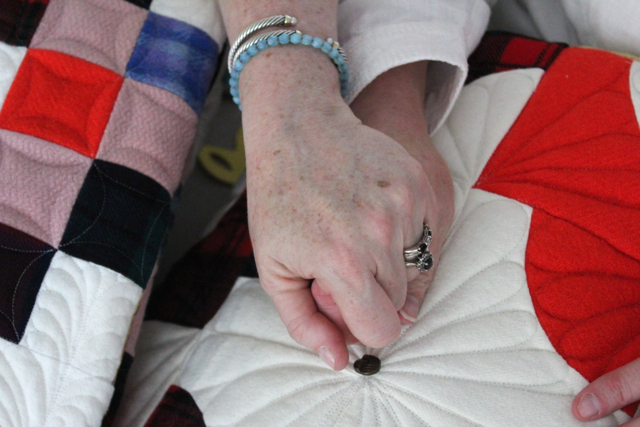 Your quilt will be made free of charge – please contact me to discuss your families wishes. - I will carefully store any clothing/uniforms until you are ready to proceed with your Memorial Quilt. I will ensure I have your confirmation to proceed before beginning any work with your loved ones items. - Your loved one’s clothes/uniform will be treated with the care and respect they deserve. They will be washed and dried before being used for the quilt to ensure no shrinkage of your quilt will occur. - Once a design has been agreed upon I will dissemble the clothes and try to use every piece of fabric possible in the quilt.. No piece of clothing/uniform will be discarded unless you instruct me to do so.